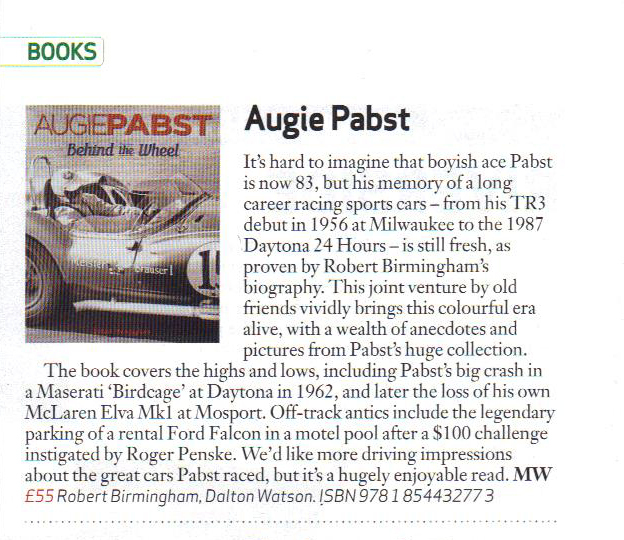 Augie Pabst was one of the best American sports car racers from 1956-1965. He started in small production cars and progressed rapidly to the best and fastest sports racing cars of the day. Along the way he scored many major victories and won two National Championships. He not only raced on all the major US and Canadian courses, but also on the international stage at Le Mans, Brands Hatch, and Nassau. His career was marked by two-year stints at three of the very best American teams; Meister Bräuser, Briggs Cunningham, and Mecom. He raced against and often beat not only the top US drivers, but many international stars as well. Pabst had a disarming boyish charm, accentuated by a wide smile and engaging personality. He raced hard, won often, and had a great time while doing it. He was a favorite on and off the track and was well-liked by all who came into contact with him: fellow drivers, team members, and fans everywhere. Order the signed edition here. Author Bob Birmingham was employed by Pabst Motors for ten years, the last few as Sales Manager. During that time he was privileged to witness countless Pabst racing victories, often starting well back on the grid behind him and driving a Fiat 1200 roadster, Stanguellini Formula Junior, Triumph TR3 or Ferrari 250 GT Berlinetta coupe. Bob served on the SCCA Milwaukee Region's Board of Directors and, upon retiring from competition, as a National Chief Steward. He also had a 27-year career with Firstar Bank (formerly First Wisconsin National Bank), retiring as a Vice President, and has since been involved in many volunteer activities. Bob resides in Mequon, Wisconsin, a suburb of Milwaukee, Wisconsin, with his wife Sally and nearby to his three children and six grandchildren. Great book detailing Augie's life as a racer. However, I know Augie quite well and I was anticipating more about his personal life and how it related to and affected his racing. Not an expose but simply the facts. Augie probably steered the author away from that. Also, would have like to have more words and detail on Augie's relationship to the Pabst Brewery at the beginning of the book and not a few words at the end. Great photos and excellent presentation of the photos, especially the quality as I've personally seen many from his collection and they needed to be cleaned up and enhanced. Great job on a great guy. Yes, I'm predjudiced! I received very good service from Dalton Watson, prompt confirmation of my order and timely delivery, and the biography of Augie Pabst is excellent, well-researched, well-written, and enjoyable to read. A superb volume on one of the most important drivers of his time. A biography that is richly deserved.